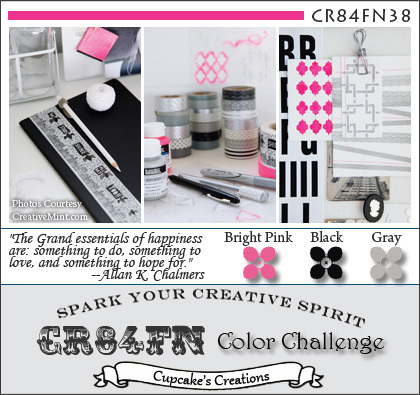 It's time for another wonderful color challenge at the CR84FN Challenge Blog, I think you're gonna just LOVE this weeks colors! I know I had a lot of ideas running through my head as what to create, and finally opted to used some new Spellbinders Dies along with a sentiment from the Artistic Outpost Typography plate. This weeks colors are Gray, Bright Pink and Black - can you believe I didn't even add any White or Vanilla to my card! I did search through my pattern papers looking for something to use, but came up empty handed, so I turned to the CuttleBug Swiss Dots folder and added some highlighting on the embossing. The Flower is created with Spellbinders Spiral Blossoms One - I just LOVE this die! I did add some embossing to the flower with a Texture Fades folder, then highlighted with ink. The Flourish is the new Floral Flourishes Die, I cut it twice from Black card stock and layered under the flower. The Black scallop was cut using the Classic Scallop Edgeabilities Die. I added a bit of scoring to the Black panel with the Scor-Pal, then accented with Pink Pearls. Here's this weeks color inspiration, we'd love for you to play along with us at CR84FN, you can find all the details here on how to enter. If you upload to any online gallery please use keyword CR84FN38 so we can find your creations! WOW, awesome card, love that flaming pink and your awesome flowers, great details. Beautiful work. Fabulous card Lisa! Love that gorgeous blossom and the textured background! So elegant looking! Lisa, you card is so stunning. The flourishes are the perfect accent to that lovely flower. Lisa, this is gorgeous. Love the flourishes you've used. The rose is really stunning, and I like the texture in it too. I think the verse is briliant. Just a fabulous card! This is a classic, Lisa. Just gorgeous! Gorgeous creation, Lisa! Love the flourish and beautiful bloom and the sentiment is just lovely! such a pretty card, lisa! Such a pretty card, Lisa! Love your use of dies! Striking! Love the design and that flower is just wow! Beautiful design too! Beautiful! Luvin' the new dies. GORGEOUS card, Lisa! LOVE your SB flower and how you embossed it! (Been playing with that die all weekend!!!) 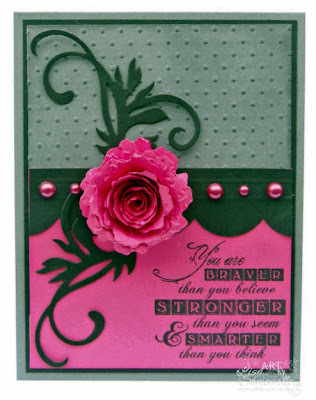 LOVE the flourish and the design of your LOVELY card! love that rose, it's gorgeous and the dotted background is perfect. Your rose is EXQUISITE Lisa!! This card is truly BEAUTIFUL! Great job with these colors! Wonderful Lisa! Stunning bloom and elegant flourishes...very nice!